To take notes on PDF files, will make sure the new users get to know the contents at a glance. For important PDF files it is very important to add notes as they let the others know what has been written. The actions which are to be taken can be specified in form of notes. Another reason for adding notes to PDF is that they can be printed in separately. It also lets the users get to the point information which makes the directions mentioned in PDF easy. There are many programs which are used to manipulate PDF on both Windows and Mac. The best program among them is PDFelement Pro for Mac and Windows. PDFelement ProPDFelement Pro is the best program which can be used to manipulate PDF on Mac. The built-in multiple markup tools make it easy to take notes on PDF files. 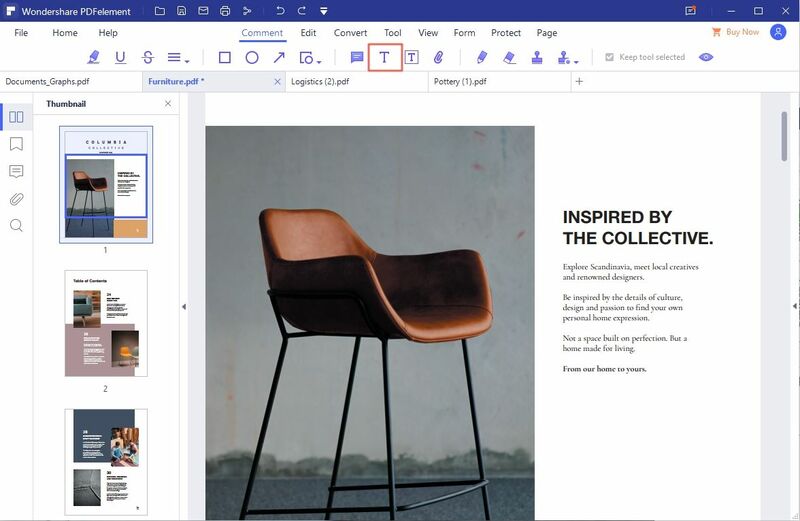 With the help of this tool, you can also easily edit texts, images, url and other element in a PDF. There are many Mac versions which are compatible with this program. It also ensures that the additional functions are performed with ease. Some features of the program are as follows. Easily take notes on PDF files and mark up PDF files with multiple markup tools. Editing tools have been added to this program. It makes editing PDF using this program to easy and hassle free. PDF form handling has been made too easy with this program. Extraction of forms well as creation has been made too easy. 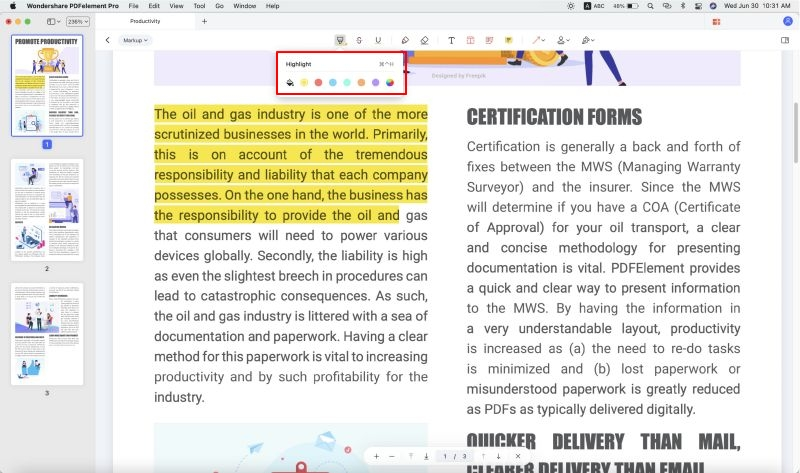 The advanced OCR feature allows user to edit and convert scanned PDF files in a few simple steps. Securing PDF from unauthorized use has never been as easy as it is with this program. The signature can be added to PDF file within seconds. The process of adding notes using this program is very easy and straightforward. It requires no additional PDF exposure of the user. Every step is self-explanatory and therefore very easy to implement. Under "Shapes" tab there are many free hand shapes available such as arrow, rectangle, polygon, connected lines, oval, squiggly lines and "Pencil" can be added by utilizing the shapes tab. The PDFelement ProPDFelement Pro works with same efficiency on Windows as it does on Mac. The interface is slightly different but the overall functionality remains the same. 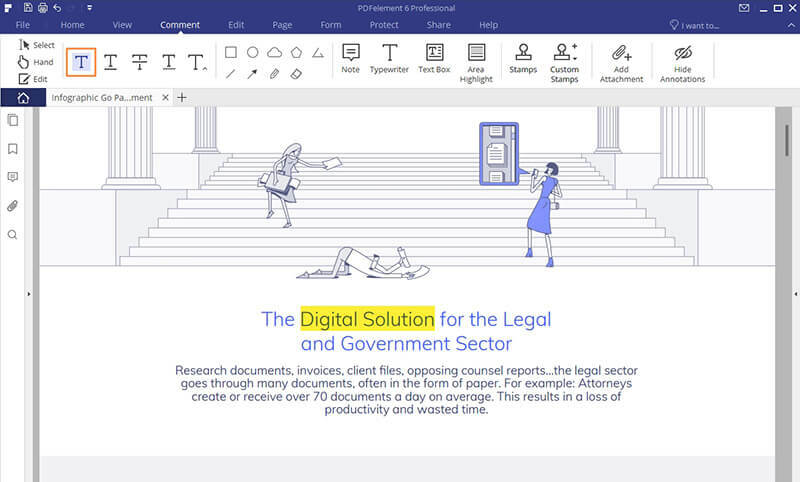 With the help of this PDF annotator, you can easily take notes on PDF documents in Windows. Highlight PDF text, add comments and notes to PDF files with ease. Convert PDF to images, Word, Excel, PPT, EPUB and convert multiple PDFs in batch. Compress PDF files in a few simple steps. Easily add watermark, signature and password to PDF for securing PDF. 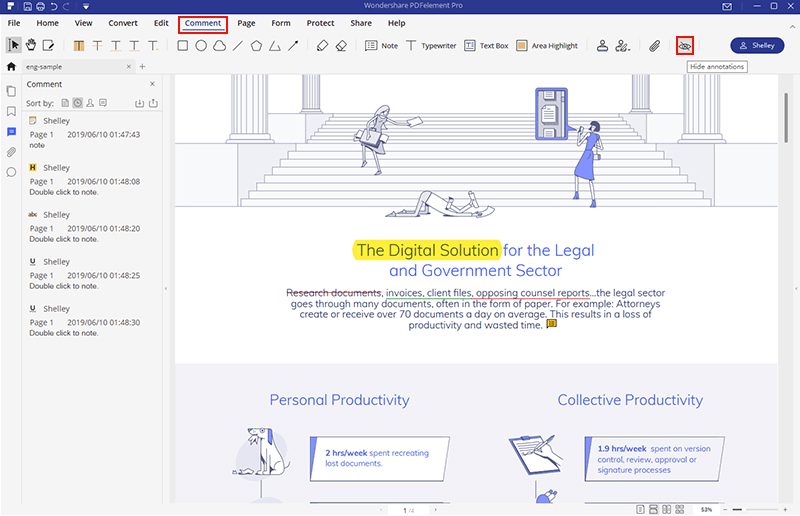 Afer downloaded and installed the PDF Annotator on your Windows, you can launch the program easily by double clicking on the icon of the program. Click on the "Open File" button on the left interface. You can easily add PDF file to the program. 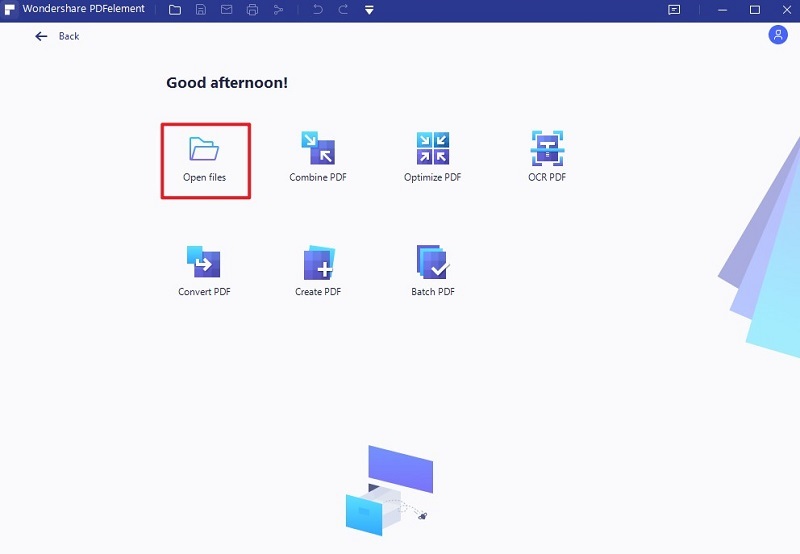 The drag and drop feature can also be used to add PDF to the program. Open the "Comment" menu on the top tool bar. Click on the "Highlight" icon and then you can choose the text to highlight. In case the annotations are to be hidden the "Hide Annotation" option can be used to perform the functionality. The same button is used to show all the annotations in case it is required.